The seasonal piano pieces that make up Kingdom of the Heart’s Content, Op. 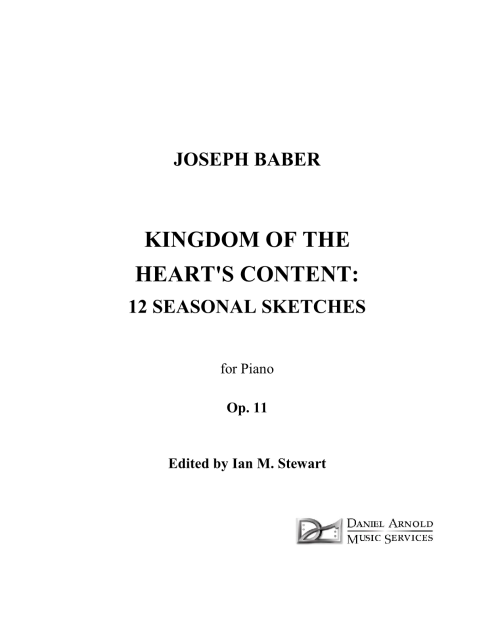 11 are a selection of the best of the piano sketches Baber wrote between 1952 and 1956, when he left Richmond, Virginia for college. His piano teacher, Marie Frick Costello, and later his composition mentor, the distinguished Virginia composer, John Powell, encouraged him to keep a notebook of musical fragments, much as a painter might keep a sketchbook. Since Baber lived in the city’s historic Fan District, there were many picturesque places about which to write, as well as friends and childhood experiences to provide subject matters for these vignettes. Some of these pieces, as played by the composer, were so improvisatory as to be "un-notatable," whimsical and mercurial to the point of being kaleidoscopic. In this edition, especially in "Monument Avenue" and "Park Avenue Triangle," italicized performing indications have been included as a guide to how they were originally conceived. However, the sudden shifts of mood, as they existed in the composer’s mind, may be more extreme than many performers will be comfortable performing. Still, these indications can serve as general guidelines. The title is a paraphrase of one by William Butler Yeats, which a literary friend showed Baber in Junior High School: The Land of Hearts-Desire.